This one was manufactured recently. Marking states 20A 125V. Pictured here with a 20A Hubbell outlet for reference. 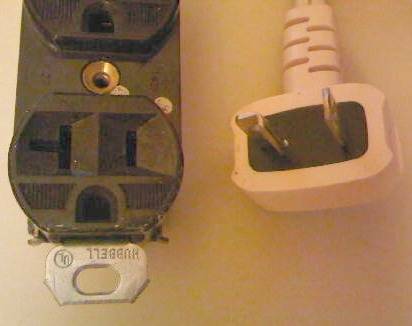 Interesting - a 20A plug that won't fit into a 20A outlet. It looks like it will only fit a 15/20A T-slot one. It looks like it will fit, but the manufacturer has definitely chintzed on what should have been the T-blade. Last edited by Retired_Helper; 12/08/09 01:18 PM. Reason: Brain minus haze equals duh. nor will it plug into a 5-15R. The Canadian outlets are configured for 15A only, or 20A only, and not dual purpose 15/20A. Typical American me, I forgot about Canada.